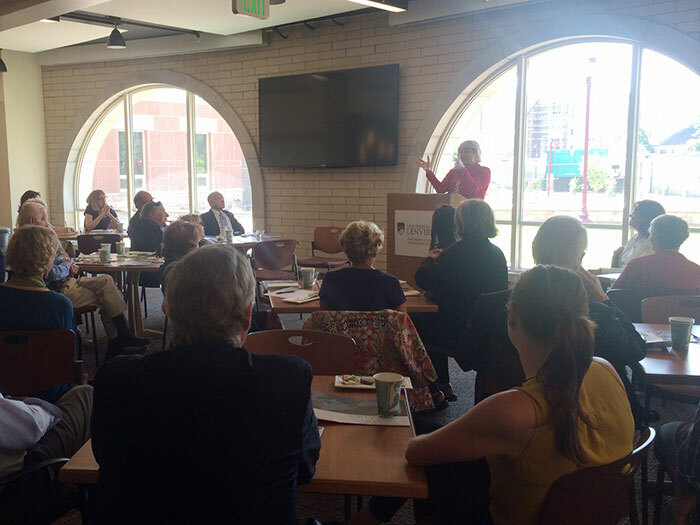 On June 10, AFSA President Ambassador Barbara Stephenson met with 25 or so Foreign Service retirees on the University of Denver campus in Denver, Colo. The meeting was part of Ambassador Stephenson’s outreach visit to Denver, where she also met with Lieutenant Governor Donna Lynne, the mayor of Denver, and members of WorldDenver and the Denver Metro Chamber of Commerce. Ambassador Stephenson encouraged those in attendance to take up AFSA’s challenge to get out there and tell the story of the Foreign Service to the American public. 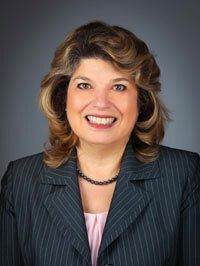 She detailed AFSA’s new outreach strategy, and encouraged them to become part of AFSA’s Speakers Bureau. Our retirees are our best advocates as we seek to create a true domestic constituency for the Foreign Service. Ambassador Arnold Chacón, the Director General of the Foreign Service, was also on hand to meet with the retirees. The DG spoke to the Department’s current recruiting efforts and his vision for the Foreign Service in 2025. FCS retiree Michael Keaveny introduced Ambassador Stephenson, and retired Ambassador Gary Grappo—currently a distinguished fellow at UD—welcomed those in attendance. AFSA appreciates the attendance of so many local retirees and looks forward to more such events around the country in the coming months. In conjunction with this year’s Foreign Service Day on May 6, AFSA reached out to Foreign Service retiree groups around the country with the aim of placing letters to the editor in local newspapers in honor of the day. This was AFSA’s first attempt at such a grassroots media campaign, and we are pleased to say that it was an unexpected success. At last count, over 15 letters had been published. We had particular success in Florida and Texas, for which we thank the very active retiree groups in those states. We plan to expand this effort in advance of next year’s Foreign Service Day, and hope that all retirees will stand ready to contact their hometown newspapers with a letter that honors the Foreign Service on the first Friday in May. On April 28, the Senate passed the FY16 authorization bill for the Department of State. The Senate Foreign Relations Committee has also passed an FY17 authorization bill, and the House Foreign Affairs Committee passed an amended version of the Senate FY16 bill. Neither one has been passed by the full Senate and House, respectively. As you will have seen in AFSAnet messages we sent on April 26 and May 26, the bills contain some issues that concern AFSA – specifically, a lateral entry provision and expansion of the Overseas Development Program. AFSA is engaged with relevant interlocutors on the Hill, and we have made our views on these issues widely known. Stay tuned for further reports as the process moves along. On May 5, the AFSA Scholarship Fund held its annual merit awards ceremony. 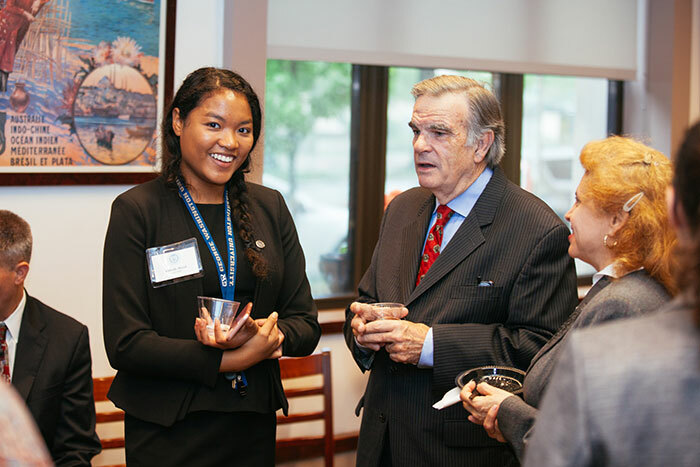 The occasion provided a great opportunity for local retiree donors to meet and congratulate the student recipients – all children of Foreign Service members – on their many accomplishments. This year, a total of $45,500 in merit scholarships was bestowed on 22 high school seniors. These students received awards for their outstanding achievements in academics, art, and community service. Recipients received $2,500 as winners and $500-1,000 went to honorable mentions. Retiree support continues to play a significant role in the success of the program as a number of generous individuals within the community have established scholarships with AFSA. In total, ten named awards have been established and are bestowed to the highest scoring students. For more information on these winners and the scholarship program, visit www.afsa.org/scholar or contact Lori Dec at (202) 944-5504 or dec@afsa.org. 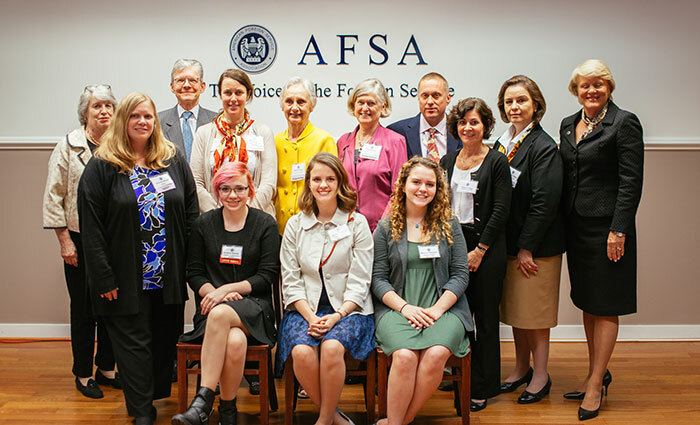 On May 6, the American Foreign Service Association took part in the Department of State’s annual Foreign Affairs Day celebration. Held each year on the first Friday in May, Foreign Affairs Day is meant to honor retired and active duty employees of foreign affairs agencies as well as commemorate those who lost their lives while serving our country. Over 300 retired members of the Foreign Service returned to the State Department to attend a number of seminars discussing developments in United States foreign policy. The mood was jovial as old friends reunited and reminisced about experiences while abroad. Those in attendance welcomed references to the original Senate resolution establishing the first Friday of May as Foreign Service Day and appreciated recognition of the exceptional service, dedication and sacrifice members of the Foreign Service make every day as they protect American interests abroad. AFSA continues to support efforts to raise awareness of the Foreign Service, chiefly by encouraging member to tell their Foreign Service stories to audiences across America. In her remarks at the reception held at AFSA HQ to close out the day’s festivities, AFSA president Ambassador Barbara Stephenson encouraged attendees to continue promoting the honorable work of Foreign Service members in their home communities through speeches at local venues and writing letters to the editors of local publications. It is through these small steps that the public becomes more informed about the work of America’s Foreign Service. This year’s celebration commemorated the tireless and truly honorable work employees of all foreign affairs agencies do abroad. It is vital to continue to promote the work of Foreign Service members and share their stories with the public. On May 12, American Foreign Service Protective Association (AFSPA) CEO Paula Jakub appeared at AFSA for a second encore of her popular seminar: “Medicare and the FEHB – Putting It Together.” As on the previous two occasions, the house was packed, with close to a hundred in the audience. AFSA encourages all members to avail themselves of the recording of this event, which is available to view on the AFSA website at www.afsa.org/video. Contact us at retiree@afsa.org or (202) 338-4045.